Sometimes all you need is a furniture piece that will change it all. We got them here! A modern living room with mid-century vibes is just what most people look for. Sophisticated, elegant and up-to-date, a living room should always have the perfect casegoods to pair up with your sofa and center tables. Today, we’ll show you modern sideboards that are just a must-have for this new season. Monocles is a sideboard built entirely out of solid walnut wood, accented by its gold plated brass front doors that feature a protruding circular design. These circles are then engraved to the back and side of the unit, giving it an extreme character and high end look. It is a perfect furniture piece for retro lovers or mid-century admirers, giving the knurling knobs on the drawers or the tapered legs. Even for a modern living room, there is no better choice given the timeless design of this piece. Sideboards are usually made out of wood. Edith it’s not, that’s why it is a distinctive piece to furnish your living room. It is upholstered with a soft velvet, and stands out for its high-end look at the top, making use of a grey textured marble. It features a curvilinear body with sleek and simple legs made of brass, that contrasts with strong accents of gold. A statement storage piece for the retro chic lovers that will be absolutely stunning on your Fall inspired living room. Given the fact its customizable, you can get the trendy colors for this season on its already incredible design. Retro and contemporary style were combined together to create Anthony mid-century modern living sideboard. Stunningly produced in solid walnut wood, it is topped by a white polished marble and supported by brass square feet. It brings a playful geometric pattern on its doors, accented by its rounded edges and the brass trim all over the body. You can’t go wrong with a classic and beautiful design like the Anthony’s. Dandy is a sleek and stylish sideboard that will be ideal for your Fall living room. Since it is very versatile, it can be used as a drinks cabinet and be placed both in a living or dressing room. Its body is entirely made of solid walnut wood and it resembles a kitsch radio because of its shape and the use of grill cloth on the doors. 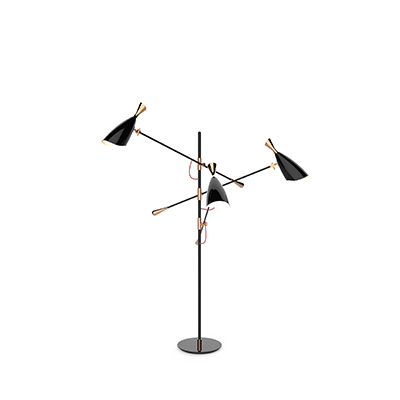 It is accented by a brass trim on the body edges and supported by tapered legs with brass ferrules. The best from Scandinavian design roots. Kahn is a sideboard that will bring a strong presence to your living room. It is produced in black poplar, a type of cottonwood, and brass trims that are laid out symmetrically to provide an overall sense of unity and form. The wooden interior is glazed with a soft caramel tone producing a gorgeous effect as you open its drawers. For a modern and contemporary living room, this sideboard is the perfect complement, pairing up amazingly with browns and neutral colors.